In this issue we focus on the Palace Museum (Gugong bowuyuan or Gugong), which celebrated its 80th anniversary on 10 October 2005. In fact, a museum had been established in the Forbidden City almost a decade prior to 1925, and here we look at the history of that institutional precursor, known simply in English as the 'Government Museum'. The most recent chapter in the Palace Museum's dramatic history has seen vast restoration work and consolidation of the museum's role as a centre of art-historical intellectual enquiry since the appointment of its new director, Zheng Xinmiao, in 2002. As a member of the Chinese People's Political Consultative Conference, Zheng (b.1947) has a well-documented history of active involvement with conservation issues, in association with Luo Zhewen and Shan Shiyuan, both long-term scholars of the museum. As both Director of the Palace Museum and Vice-Minister of Culture, Zheng has written extensively on what he terms 'Gugong studies', a multidisciplinary field of enquiry that encompasses art-historical Sinology dealing with palaces, palace cultures, ritual conventions, collections, archives, architectural history and artefact history (ranging from fine arts to folk arts), to name only the more salient aspects of the field, all centred on the physical monument of the Gugong (Palace Museum) and its antecedents throughout Chinese history. Extending the earlier notion of 'Forbidden City studies', Zheng's 'Gugong studies' warrants extensive discussion well beyond the scope of this newsletter, but under the rubric of this new 'discipline' much exciting new work by younger scholars has been encouraged, produced and published. Here we can only hope to provide an overview of the museum and some of its work. Are the Octogenarian Twins Coming of Age? The 10th of October 2005, marked the 80th anniversary of the founding of the Palace Museum in Beijing. When established back in 1925, the museum was "entrusted with overseeing the preservation of the palace buildings, together with the opening and publicising of them, as well as of the ancient objects, books and archives that belong to the palace." This was the briefest of briefs for what would become the world's most extensive museum, now covering an area of 720,000 sq m, and having more than 9,000 rooms. This terse and unadorned duty statement from the Republican government's Department of Internal Affairs (Neiwu-bu), outlining the tasks assigned to the museum, did not emphasize museological concerns; it simply set out a custodial role for the museum's administrators, reflecting the revolutionary Nationalist government's desire to occupy the Forbidden City, the space at the centre of political intrigue from the 1911 Revolution onwards. Since its founding, the Palace Museum has been located, physically and symbolically, near the centre of Chinese political life. Straddling Qing dynasty Beijing's north-south 'axis' and occupying the emperor's former living quarters in the Forbidden City, the museum is also adjacent to Zhongnan Hai (the 'Sea Palaces') and Tian'anmen. Although the museum is now free from factional power politics on the mainland, the Palace Museum in Beijing and the National Palace Museum, its doppelgänger in Taipei, remain as monumental reminders of the civil war between the Chinese Communist Party (CCP) and the Chinese Nationalist Party (KMT). The Palace Museum was established in 1925 on the tenth day of the tenth month or 'Double Ten', the Republican National Day, and on that day this year the 80th anniversary of the museum's founding was celebrated in Beijing, with no acknowledgment that this was also the National Day of the Republic of China. In 2003, Zheng Xinmiao (Fig. 1), the director of the Palace Museum and a deputy-minister of the Chinese Ministry of Culture, attempted to convince the director of the National Palace Museum (NPM) in Taipei, Tu Cheng-sheng (now Minister of Education in Taiwan), that these rudely separated, but once conjoined, institutional twins stage a joint exhibition to mark the 80th anniversary of their parent museum's founding. 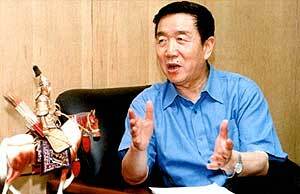 Zheng's approach reflected the CCP's wooing of the KMT which is based on the wish that the clock be turned back and the civil war resolved by the sole parties it once engaged, thereby marginalising new forces in Taiwan and pre-empting potential elements on the mainland that might alter the CCP-KMT symmetry perceived or projected by the policy makers of the People's Republic of China. The flight to Taiwan in 1949 of the KMT with many of the finest pieces of the Palace Museum's collection still rankles among mainlanders who fear that some of the most valuable elements of China's cultural heritage might slip beyond China's grasp if Taiwan were to become independent. Zheng attempted to reassure Tu that items from Taipei exhibited in Beijing would not be seized, and that Beijing would contribute objects of equal or greater value for simultaneous exhibition in Taipei. Beijing's Palace Museum and Taipei's NPM began 'open' cultural exchanges in 1992 as 'cross-straits' tensions began to ease. The two museums have collaborated in compiling catalogues of some of their collections and the Palace Museum has participated in the organisation of mainland exhibitions in Taiwan. Beijing's Palace Museum holds the world's largest collection of Chinese art, while Taipei's NPM has the world's second-largest, all of it brought to Taiwan from China in 1949 following the KMT defeat in the civil war. Ironically, in the growing mainland literature on the 'foreign outflow' (liuwai) of China's cultural heritage over the past two centuries, the vast quantities of grade one national treasures in Taiwan are never mentioned. Their temporary 'storage' in Taiwan is overlooked. More pointedly discomforting for the curators of Beijing's Palace Museum is the fact that the NPM is now diversifying to establish a network of regional museums in Taiwan that will focus on Taiwanese and world heritage, rather than Chinese heritage. Taiwan is recognised by few nations as the Republic of China (ROC), but many people in Taiwan regard the NPM's treasures as the legitimisation of the ROC's status. As a result, public opinion there was opposed to the display of NPM objects in the USA in 1996 and 1997, in France in 1998 and in Germany in 2003. Before allowing objects from the NPM to be exhibited in the USA and Europe, the curators in Taiwan demanded written guarantees that the artefacts would enjoy immunity from judicial seizure in the United States, and, similarly in the latter case, that guarantees be extended ensuring that the EU law requiring artefacts on display in EU nations to be returned to their country of origin not be interpreted to mean that the country of origin of these objects was China. Although the NPM eventually went ahead and sent objects to the USA and Europe, no joint exhibition was staged this year by the Palace Museum and the NPM, although as early as 2002 Tu Cheng-sheng had suggested that the two museums could possibly stage a joint exhibition in a third country. Nevertheless, this failure to stage a joint exhibition did not preclude large numbers of NPM scholars from attending the three international seminars held by the Palace Museum in Beijing in October 2005 to celebrate its 80th anniversary, and a further sharing of early museum archives was initiated.